We spend our lives in constant motion and often find it hard to resist the urge to “do more.” Restorative Yoga is a meditative practice in which you let go of holding yourself up and allow yourself to be fully supported by a variety of props. Props help shape the body enabling each student to let go of all muscular contractions and safely move towards a state of balance. While traditional hatha poses require muscular effort to maintain alignment, restorative yoga poses are done with no muscular effort. It is easier to move through poses in a traditional hatha yoga class where your mind is distracted by the physical demands of the poses versus the stillness of a restorative practice. What happens when there is nothing to do and there is no activity to distract you? The mind becomes the focus and your most vulnerable places can be exposed. This state of being can be challenging for many students. However; it is where self – acceptance begins and change happens. The more the body is supported in these passive stretches the deeper the sense of releasing the inner grip of your muscular, emotional, and energetic body. The more you practice relaxing and releasing tension, the more familiar you will become with what you need to do in order to relax and the easier it becomes to stay calm, even in life’s most challenging circumstances. When you taste this renewed state of being, your mind clears, your heart opens, and your sense of self expands. celebrate the joy of giving! 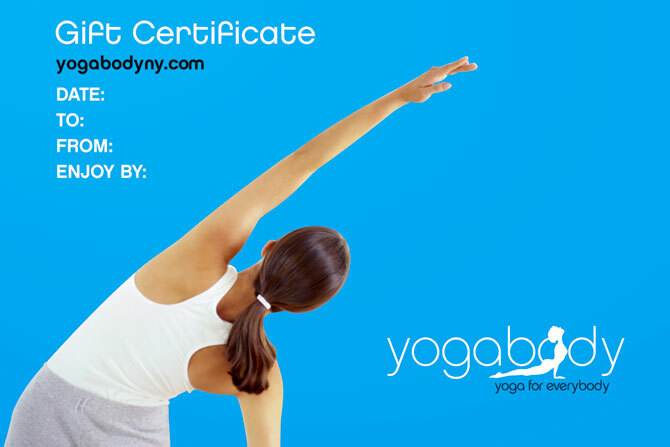 Share the gift of yoga and good health with someone you love with a yogabody gift certificate! Eco-friendly yoga mats and luxurious 100% silk eye pillows also available. so roll out your mat and get started! I recently participated in a class at the Iyengar Institute in NYC which focused on alignment in all poses and anatomically precise terms to convey it. B.K.S. Iyengar pioneered the use of props as learning tools and the use of yoga as a therapeutic tool. His discoveries provided evidence of yoga’s power to deal with a host of maladies, and are recognized in the scientific and medical communities. The purpose of all Iyengar classes is to practice each asana by aligning and harmonizing the physical body and all the layers, or sheaths, of the subtle emotional, mental and spiritual body. This integration begins with awareness. In class I often ask you to sense and feel an area in your body where you experience tension or resistance, to focus on that area by sending several breaths into that area, and to allow time for the minds signals to reach that area and allow it to release or ease up. This marriage between awareness of the body and that of the mind is the only way to create conscious movement and more action in the body. Yoga teaches us how to infuse our movement with intelligence, transforming it into action. This gives us the ability to question whether a movement is right or wrong, and what we can do to change it. We think of intelligence and perception as taking place exclusively in our brains, but yoga teaches us that awareness and intelligence must permeate the body. Each part of the body literally has to be engulfed by the intelligence. Yoga is about communication and contact of all the threads and fibers of our being at every level. Let the body be the doer, the brain the observer. The duty of the brain is to receive knowledge from the body and then guide the body to further refine the action. In each asana ask yourself, ‘What am I doing?” and “Why am I doing it?” This opens the mind and allows us to develop our self-awareness. Students in my classes are often concerned about Osteopenia, low bone mass, or Osteoporosis, bone deterioration. It seems that by a certain age, almost everyone has some degree of bone loss which is a natural part of aging. In a recent article published in Yoga Journal Magazine, yoga and a plant-based diet may be the best choices for bone health. You can slow – and sometimes even reverse –bone loss by tackling it head-on, but it takes time and a concerted effort. The National Institutes of Health estimate that 10 million Americans have osteoporosis and another 34 million have osteopenia. Although, men have it, too, when it comes to bone loss, women suffer more. A plant-based diet of alkaline –rich fruits and vegetables and keeping acidic foods; cheese, meat, eggs and fish to a minimum creates a foundation for healthy bones. That’s because proteins are acid forming and when too much acid enters the blood stream, the body pulls calcium, which is alkaline, from bone to neutralize it. Lynda Frassetto, MD, a kidney specialist at the University of California, San Francisco, and the principal author of a cross-cultural study on how protein in the diet impact bone health looked at diet and hip fracture in 33 countries. She found a direct link between high consumptions of animal protein and a higher number of hip fractures in women age 50 and older. In Yoga you perform many weight-bearing exercises where you hold the weight of your body up against gravity. Resisting gravity puts a mild stress on the bones. That stress forces bones into laying down new growth without damaging cartilage or stressing the joints as in jogging, walking or even playing tennis. Instead, it lengthens muscles and holds them there, creating tension on the bone. According to Sara Meeks, a Kripalu yoga teacher since 1984 and a physical therapist specializing osteoporosis, that pull of muscle on the bone is the single major factor in bone strength. Practicing weight-bearing poses like; Tree Pose (Vrksasana), Chair Pose (Utkatasana), Cobra Pose (Bhujangasana with arms at the sides), Bridge Pose (Setu Bandha Sarvangasana, Triangle Pose (Trikonasana), Downward Dog (Adho Mukha Svansasana),Warrior Pose I (VirabhadrasanaI), Warrior II (Virabhadrasana II), and Alternate arm and leg lifts (start on all fours, and lift and extend opposite arm and leg) are sufficient to trigger new bone growth and strengthen your skeleton. Stay in each pose for a minimum of 30 seconds or try holding each one for five breaths. According to Meeks, in Warrior I and II, the legs are weight bearing because they support the body’s weight. But by bending the front knee to 90 degrees, you do more than simply bear weight in the front leg; you magnify the force on the femur, the largest, longest, and strongest single bone in the body, says Loren Fishman, MD, an assistant clinical professor at the Columbia College of Physicians and Surgeons in New York and the co-author of Yoga for Osteoporosis. It is the head of the femur which tapers into a thin neck, and is the most vulnerable part of the upper femur. This is generally the site where fractures happen due to osteoporosis. In Warrior II, you’re also adding force to the shoulder joint when you hold your arms out away from your body. This puts a lot more stress on the head of your humerus (upper arm bone), one of three bones that forms the shoulder joint, than you would if they were hanging at your sides. According to Annie Kay, MS, RD, an integrative dietician at Kripalu Center for Yoga & Health, a yoga therapist and the former director of the osteoporosis awareness program at the Massachusetts Department of Public Health, “We absolutely see a strong correlation between a plant-based diet and bone mineral density.” A study published in the journal Topics in Geriatric Rehabilitation showed that over a two year period participants who practiced yoga regularly gained bone in both the spine and the hip. It seems that by putting tremendous pressure on the bones without harming the joints, yoga may be the answer to osteoporosis. If you want to prevent bone loss, any amount of yoga will likely prevent or reverse early-stage bone loss. If you have osteopenia or osteoporosis, deep forward bends should not be practiced to the full pose or your full range. They may cause a spinal fracture by excessively loading the front of the vertebrae compared with your back. Deep twists are another potential danger zone because they can put the spine in a vulnerable position. Supine twists are preferred as they support the spine and it is elongated. If you are still in prevention mode, all poses are up for grabs, including forward bends, back bends, twists, and inversions. If you build up the bones when you are young, you can afford to lose a little bit as you age. Although gentle Hatha Yoga has its benefits developing a more strength-building practice is essential to enhance bone health. Pack your diet with low-acid veggies like kale, spinach, broccoli, cabbage, zucchini and tomatoes. Enjoy low-acid fresh fruits like apples, pineapple, bananas, oranges and peaches. Limit high-acid forming foods like cheese, meat, eggs, and fish. Most importantly come to yoga with a smile, and ready to move. “Yoga is a light which, once lit, will never dim. Maintaining a regular yoga practice and integrating the tools you learn in yoga into your fast paced everyday lives is the key to receiving the benefits of this wonderful practice. No matter what your energy level is or how much time you have, a regular practice will make you stronger, increase flexibility, improve balance, bring renewed clarity to the mind, and lift your spirits. Remember improvement happens fast. So keep with it! New to yoga and not sure where to start? Allow us to introduce you to the basics of yoga. Already have some experience? Yogabody basics is a great way to reinforce yoga skills that will help you continue to build your practice. We are currently forming a yogabody basics level class for beginners on Monday mornings at 11:15 am. Anyone who is interested please contact us via email or phone. ringing in the new year with metta, a loving-kindness meditation! Recently I attended a Metta Meditation with Jill Satterfield, founder of the School for Compassionate Action in New York City. As part of an all day workshop entitled, Loving What Is, she modeled how to develop a Metta Buddhist meditation- a loving-kindness meditation- which celebrates the happiness of all beings. Weaving it into the asana practice we experienced how positive thinking and unconditional compassion for ourselves can lead naturally to unconditional compassion for others. This creates the essential balance and attitudinal changes necessary to break down the barriers between ourselves and others. Ms. Satterfield used a visualization technique, and a mantra or phrase, to help arouse feelings of loving acceptance of one self in order to systematically develop and send loving-kindness towards others. We were encouraged to empathize with other people’s difficulties and to cultivate an appreciation of other people’s qualities or good fortune. Can you list five things that bring you joy? Offer these appreciative and encouraging phrases and intentions to yourself and to others. Keep your mind fixed on any positive feelings that arise, and if it strays then bring it back to the mantra to strengthen the feeling again. Be aware that at first it might feel mechanical to repeat the phrases but don’t give up. Tune in to how you are feeling at the start of the practice and notice how the quality of your heart changes as you repeat the phrases to yourself and move through the poses. Loving-kindness is a heart meditation which can be incorporated into your daily life- at home, at work, in the community, and into all your relationships. Start with this short sequence and allow it to become your daily mantra as you move into the New Year. Applying this practice to your life has the immediate benefit of increasing your joy, changing old negative patterns of the mind, and creating a feeling of openness toward everybody you relate to. Like love, happiness increases exponentially when it is shared! We are pleased to announce the official launching of the yogabody website and studio in Woodmere, NY. The website provides information about yogabody, it’s classes, back care, it’s schedule, it’s rates and recent news. We hope you will enjoy surfing the site and we welcome your comments and suggestions through the sites “contact” page. The yogabody studio offers mixed level classes and private sessions in an inviting and relaxed atmosphere. Our philosophy is that through a well-rounded practice of yoga each student can develop a “yoga lifestyle.” This maintains using the tools and lessons learned in each class to guide us through our day to day choices. As we apply what we learn on the mat to our daily lives, we will expand our perspectives and focus, gaining greater connection to our inner-core. Ultimately, this helps to achieve an increased sense of balance and control with a healthier and more centered life. 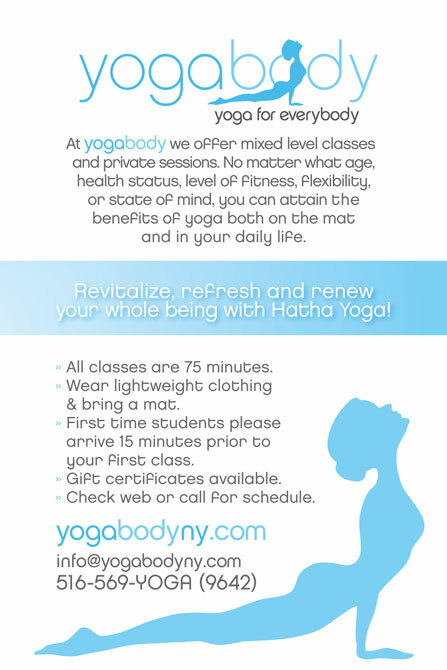 Revitalize, renew, and refresh your whole being with Hatha Yoga! "I have been practicing yoga for many years. Much to my surprise I encountered a jewel of a yoga instructor at the Community Education and Services program in my local school district. Andrea brings another dimension to my yoga practice. In her warm and compassionate way we are encouraged to explore our own limits. Whether it is in a group of 16 or 6, Andrea has the talent to tap into everyone’s individual needs. She has created a relaxed, zen-like atmosphere in her home studio which makes additional sessions most enjoyable. It is apparent that Andrea is well-trained. In her supportive ways she makes every session a rewarding experience. The most difficult part of my yoga sessions with Andrea is leaving. I am grateful for the opportunity to learn from such a master. It is a pleasure and an honor to attend her class." Susan S.